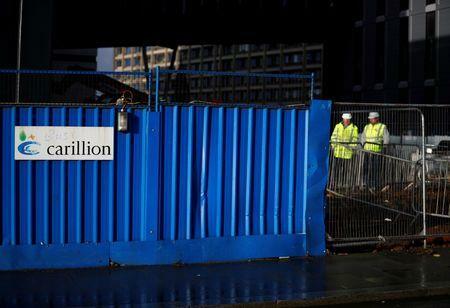 (Reuters) - Britain's Financial Reporting Council (FRC) said on Monday it commenced an investigation into the conduct of two former finance directors of bankrupt construction firm Carillion plc <CLLN.L>. The FRC in January opened an investigation into KPMG's auditing of the now-collapsed Carillion covering the years 2014 to 2017. The investigation into former group finance directors Richard Adam and Zafar Khan will be conducted under the Accountancy Scheme, FRC said on Monday. The investigation is in relation to the preparation and approval of the financial statements of Carillion for theyears 2014 to 2016, the first half of 2017 and the preparation and reporting of other financial information during the period 2014-2017, the watchdog said. The FRC said it is liaising with UK's Official Receiver, the Financial Conduct Authority, the Insolvency Service and The Pensions Regulator to ensure a "joined-up approach" to the investigation of matters arising from the collapse of Carillion. Construction and outsourcing firm Carillion collapsed in January after banks pulled the plug, raising concerns about hospitals, road and other infrastructure projects and the fate of hundreds of suppliers.